"This luscious spread can be used on Cuban bread or any fruit loaves. 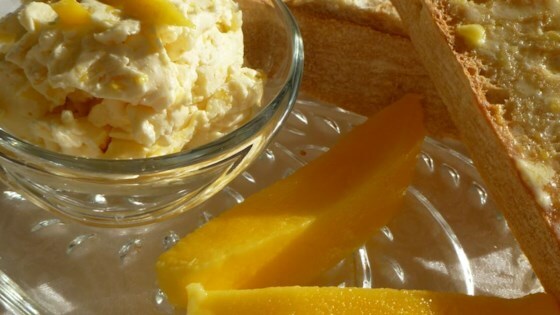 You can make papaya butter by substituting papaya for the mango. This butter will last for 1 week in the refrigerator." Beat the honey, butter, and mango together in a mixing bowl with an electric mixer until evenly blended. Ok, but it was more like honey butter with mango chunks. Would have been nicer if the flavor was through out the butter. I prepared as directed and was creamed just fine. Too much honey. Couldn't taste mango at all. Will try again with less honey, more butter and a bit of flour to thicken.